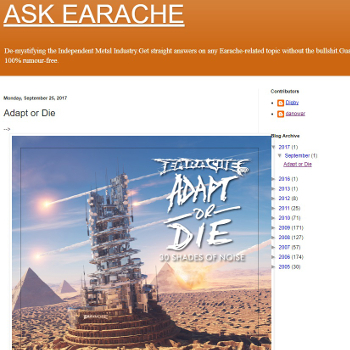 Earache, the pioneering metal label from the U.K., maintains a long-running blogspot called “Ask Earache” that’s worth some browsing time. Many of the other blog entries address questions about Earache releases, reissues, and DVDs, and the music business. There’s a lot to dig through: label manager Dan Tobin and founder Digby Pearson have been posting here on and off since 2005. This entry was posted in News and tagged adapt or die, book, Carcass, Earache, UK by Editor. Bookmark the permalink.